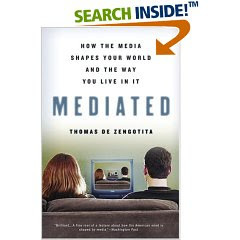 She writes: "The actual process of mediation takes place, de Zengotita explains, when what is real is represented through any form of media (think of anything from a home video to a multimillion-dollar biopic). As representations grow in variety, sophistication, and intensity, they create what he calls a “psychic sauna” of experiences, sensations, and options that we glide over the surface of, like “a little god, dipping in here and there. . . .” In a mediated world, the flattered self is the center of the universe—the consumer, the viewer, the holder of the remote control—able to opt in or out whether it be in regard to a television set or reality itself. And indeed, technological advancements make it harder and harder to even tell the difference between the two. (Take a movie like Troy, where it's impossible to distinguish the real sets, which are themselves representations of the real city of Troy, from the computer-generated ones.) And as the flood of representation becomes faster, more sensational and ubiquitous, we rarely even make the time or effort to distinguish between what is real and what is synthetic, simulated, or replicated."